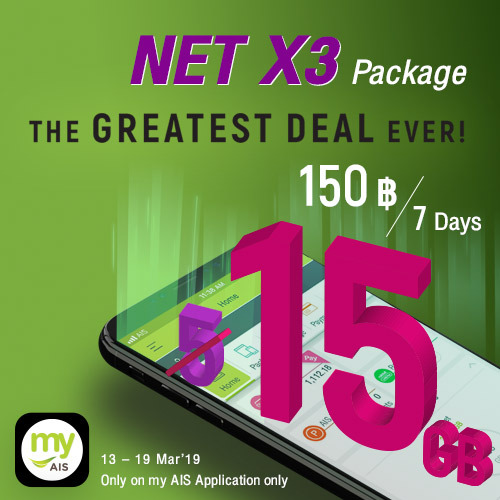 The offer is reserved for AIS customers who log in to My AIS Application for the first time only. Please wait for an SMS confirm before use package. Multi SIM customer, the package will useable with primary SIM card only. Easy for all transactions. Anytime. Anywhere. Conveniently check your current packages, data/voice balances, and many other services yourself, anywhere anytime. More user-friendly than ever! Going forward with full digital services, AIS is the first mobile and fixed broadband operator who provides eReceipt & eTax invoice service to customers for more convenience lifestyle. Enhance your mobile experience with exclusive add-on packages to match your usage style. Simply use the My AIS application. More to enjoy with bonus points for getting more. Get bonus points when making a transaction using the My AIS. Simply log in, pay the bill, add credit and subscribe to AIS eBill. with bonus points for getting more. When you login my AIS application or website, you will earn 1 point per month. In order to get point from payment, you need to pay a full balance, and by the due date of your bill. If you pay for another number, the point will automatically add to the number that uses to login. For top up, If you top up start from 100 baht per transaction, you will get point up to 5 points per month. 60 points from AIS eBill preserve for the customer who first register only. Bonus points will be automatically added to your profile after making the transaction on next day. Bonus points will combine with your AIS points to redeem various privileges from AIS. Manage things much easier with one login My AIS allows you to access all your AIS number accounts by logging in only once. 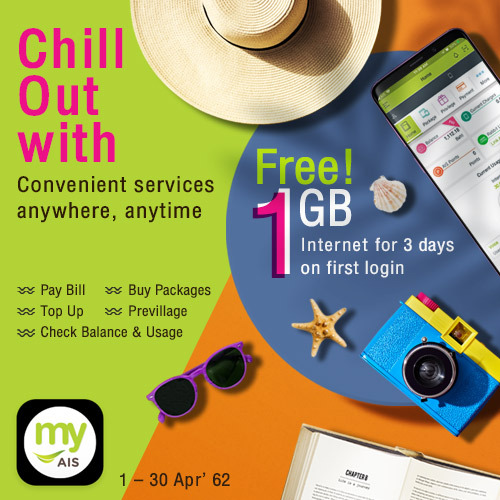 It is really convenient to manage your AIS postpaid, AIS 1-2-Call! and AIS Fibre accounts all at one go. No more waiting. No more holding the line. No closing time. Aunjai is ready to help you with any AIS service question - 24 hours a day, 7 days a week. Download the My AIS Application. 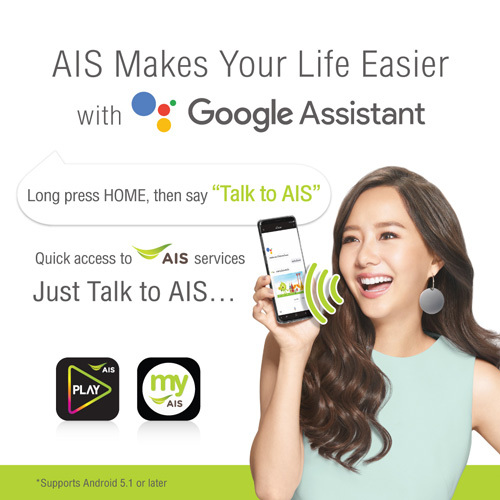 Go to the My AIS subscription menu. Enter your primary phone number, ID card number and email. Enter the password you received via SMS and set your new password for the next login. The new password must have at least 8 characters. Enter the password you received via email and set your new password for the next login. The new password must have at least 8 characters. Verify your subscribed phone number and internet account prior to confirming the subscription. Select the service payment for the mobile, postpaid, or your AIS Fibre account. You can pay bills from your account(s) or other AIS numbers. Fill in the payment information on the ‘Verified by VISA’ or ‘SafeKey’ secured payment system form. Choose your top-up method: credit card, debit card, mPAY Wallet or AIS Top-Up. Then fill in the number you want to top up. Verify the top-up destination number and amount. The Customer can view updates on store discounts or privileges by selecting ‘Points & Privileges’. The Customer can view details of the selected privilege then click ‘Redeem’ to exchange points. The Customer can select ‘Confirm’ to exchange points and claim the privilege. Tip: You can quickly customize turn Touch ID / Fingerprint on or off, if you don’t like it. 1.When you log in my AIS, the alert pop-up will appear on screen, just press to access. You can use Log in instead of Touch ID / Fingerprint to access my AIS. After scanning a finger, or enter the passcode successfully, you can access to my AIS normally. Enter your primary phone number and email. When you log in my AIS, the alert pop-up will appear on screen, just press to access.